A complex bouquet of lime zest, pink grapefruit and classic wet stone minerality. 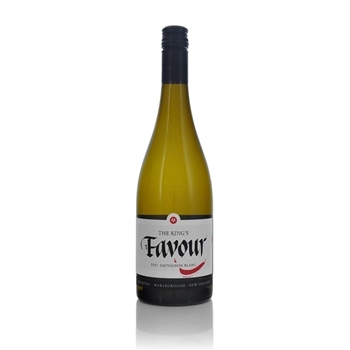 Lush and fleshy with a complex blend of powerful Sauvignon fruit character, these bold flavours and plush textures are given length and definition by brisk, juicy acids that cleanse and freshen the palate. Length, balance and harmony are very evident with this wine with it finishing clean crisp and bright. Perfect as an aperitif, no food required but if you do have to nibble, try the King’s Favour alongside crushed pea fish cakes with lime and chilli mayonnaise. 95/100 A beauty with an expressive bouquet of dried herbs, Granny Smith apples, gooseberries and tomato stalk. The palate is concentrated and has a lot of fresh citrus notes. Theres an attractive, flinty mineral edge as well. Lovely weight and texture add to the complexity of this stunning wine. This wine is absolutely delicious, highly recommended. Thanks Andrew for suggesting this!